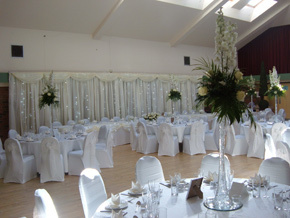 Quality Chair Cover Hire is a family run professional Chair Cover Hire company which has supplied the Wedding, Corporate and Party Industry for a number of years with high quality White, Ivory and Black Lycra chair covers which are complimented by a large range of beautiful organza sashes to co-ordinate the colour theme of your event. 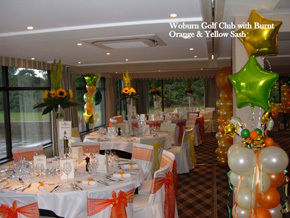 We provide a professional service with a personal touch combined with many years experience of supplying chair covers to thousands of satisfied customers. 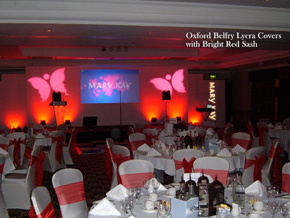 Our lycra covers will fit most types and styles of chairs including round, square top or tapered banqueting, conference, cheltenham / chivari style chairs often used in marquees, plastic stacking ( not bistro ) and folding chairs, whether it is in a School Hall or Stately Home our covers will dramatically improve the look and feel of your venue into something special which you will remember for years to come. We operate from a fully fitted industrial unit based in Milton Keynes where we launder our extensive range of chair covers and sashes using state of the art industrial washing and drying equipment. We employ highly trained dedicated staff who take pride in their work to ensure that your covers are stain free and packed in clean boxes ready for you to use. We will only accept orders which we know can be supplied. Any order placed will be checked against our forward schedule and then confirmed by email. After this confirmation you can rest assured that your order will be delivered to you on time and to an address of your choosing. 99% of orders taken are normally confirmed but if for some reason we cannot supply on the date requested your deposit will be immediately returned. Once you have completed and sent our enquiry form you will be automatically sent a quotation with a unique quote number on. The information supplied is then securely stored by us so that we can access and update your requirements if necessary. If you accept the quote just go to our website www.qualitychaircoverhire.co.uk click on the Pay Your Order tab on the top of the Home Page. This will direct you to the payment page. Just put in your quote number, decide if you would like to pay the deposit or pay in full. This will then take you to a paypal payment page. The balance less any deposit made will be payable within 21 days of the event, this can be done by following the same steps quoted above. If you prefer you can call our office on 01908 968740 where payment can be taken. We do however ask for a £ 50.00 refundable security deposit. This can be paid if preferred by cheque which can be sent to us when the Order is confirmed and an Invoice sent to you. We will not cash the cheque and will hold it until the covers are returned to us in good order. Can you fit the Covers? Unfortunately in order to keep our costs as competitive as possible we do not offer a fitting service for this type of mail order product. From experience it will take 2 people approximately 2 hours to fit 100 covers, obviously the more people who can help you the quicker it will be. Some venues will offer a fitting service as part of their Wedding package or may charge you a small amount for this service. We do offer a sample service and although our covers fit most chairs we would recommend that you use this option. Please click on the order sample now icon below and this will take you through to the paypal payment page where you can make payment. To view how the sash will look after a venue has been dressed please click on the main sash image, a popup window will display a larger picture of the sash and a dressed venue. Click on the image to close when you have finished viewing. Then after deciding on which sash you would like please select 1, or if you would like to alternate colours, 2 sashes (These will be supplied to you on a 50 / 50 basis) click on the select button below the chosen sash colour image. The sash will be highlighted with a red box, if you have made a mistake and selected the wrong sash(s), simply click the reset button below and start again. After the selection has been completed, simply click the close button in the top right hand corner and your selection(s) will automatically be saved in the information fields at step 4. Please select 1 chair type from the list below, if you are unsure of what type of chair your venue has simply select the other image. When you have finished, simply click the close link in the top right hand corner, your selection will be automatically saved.